As diplomatic relations between the United States and Cuba thaw, the island could see a new wave of tourism — with visitors treated to music and scenery that has been closed to most U.S. residents for more than half a century. But beyond the beaches and cabarets, there’s a spectacular world of wildlife, with hundreds of plants and animals that live nowhere else. Cuba is also a vital stopover for birds migrating from North America, and much of the wild area is pristine because the government hasn’t had the money to develop it. U.S. biologists are eager to explore this “green” Cuba … and help protect it. On the streets of Cuba, one of the things that you’ll hear soon enough is the country’s unique music; the syncopated rhythm of the changui musical form, for example. 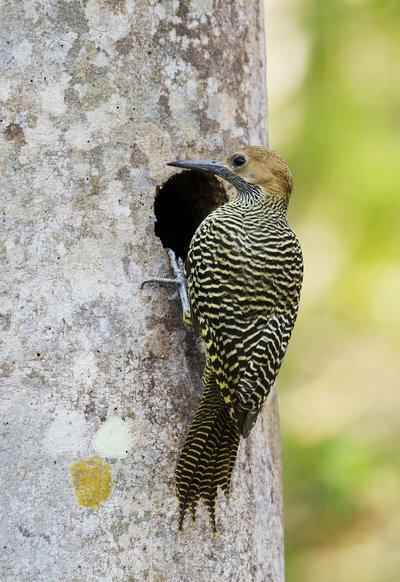 Go out into the countryside, though, to hear a different kind of music — the call of a yellow-brown woodpecker called Fernandina’s Flicker. The bird is loud and persistent and you won’t hear it anywhere else but Cuba. “It’s a native — an endemic of the savannahs of Cuba, where it’s rapidly disappearing,” says Eduardo Inigo-Elias, an ornithologist with the Cornell Lab of Ornithology in New York. Inigo-Elias says Cuba has about 750 species of birds — a fourth of them found nowhere else on Earth. But the native birds are only half the story — many North American birds visit the island every year, from backyard warblers to big raptors like the osprey. And these birds need Cuba to survive, says Cornell Lab ornithologist Greg Budney. “There are literally millions of birds, migratory birds, that are making use of Cuba as a stopping point as they cross the Caribbean,” he says. The birds rest and regroup there, and they eat — that’s why biologists want to know more about the state of Cuba’s environment. And Americans wandering around Cuba can arouse suspicion. Budney recalls one late-night trip to spot a rare bird in a forest which, unfortunately, was in an area where authorities suspected an impending drug-drop by narcotics traffickers. A midnight phone call to the country’s minister of environment ensued. The research team was briefly detained before authorities realized they were just lost birders. There could be a lot more American scientists wandering in Cuban forests soon. Doug Rader, a marine biologist with the Environmental Defense Fund, has been to Cuba more than 30 times and says he’s getting a lot of phone calls from U.S. colleagues lately. “The normalizing of relationships will unleash a tide of scientists champing at the bit to get back in,” Rader says. And they’re not all birders, by any means. Cuba has it all: unique plants, amphibians, reptiles. The string of islands is also a nursery for fish, like snapper and giant grouper, which spawn in Cuba’s numerous coral reefs. After that, their larvae float on currents up to North America, where the fish mature. One reason for all the diversity is that Cuba is the biggest island in the Caribbean. It’s got lots of room and lots of different habitats, which is a recipe for the evolution of lots of species. Also, years of economic sanctions by the U.S. slowed development that otherwise might have mowed down forests and mangroves. The result: a biological treasure trove. Scientists who know Cuba say the government does have strong environmental laws. It has already protected lots of forests and coastal zones. But newly opened doors to the U.S. could also mean more pressure to create wealth — golf courses, hotels, highways. And the lush greenhouse that is Cuba’s wilderness hangs in the balance.